Looking for fast, cheap and easy ways to use Pokemon Go for your small business? Unless you’ve been under a rock for the past week, you’ve heard and seen a ton about Pokemon Go. From groups of kids out on the street with their phones, to horror stories about people walking off cliffs in search of Pokemon, to fantastic tales of businesses being overrun by new customers, Pokemon Go has taken the nation by storm. And from a marketing standpoint, it’s an easy to use tool that lets you take advantage of this craze that’s got the potential to get people off of the couch and into your location! The game takes the old standard Pokemon to a new level, with a virtual reality game that forces the user to walk around town and hunt for Pokemon. It’s addictive to find more Pokemon, and, like any good free download game, you can upgrade by spending money to make your hunt more successful. PokeStops are places around town that players, or “trainers”, can find to get extra Pokemon or additional tools such as potions or eggs. The stops are usually set up in places like local parks, landmarks or art-related installations. You can check these on your Pokemon Go app; find the blue cubes and zoom in on them. If you are near a PokeStop, you can set up lures to get people in. These basically increase the amount of Pokemon activity near your location in half hour increments. You can buy “lure modules” by hitting shop in your profile. First, buy Pokemon coins – 100 for 99 cents, or 1,200 for $9.99. Then, figure out how many lure modules you want to buy. Each 30 minute module costs 100 coins, or the better deal is eight lure modules for 680 coins. So, essentially, for less than $7, you can host a lure party for four hours, which will bring in more Pokemon and hopefully people looking for them. Assure that you are offering special incentives for people who find the Pokemon near your business. Gyms are places where players can go to battle other “teams”. These tend to attract more advanced players and crowds can gather. You can find these by seeing the towers on your app. You can only visit a gym location when you reach level 5 on the app. Players will choose one of three teams- Mystic, Valor or Instinct – to be part of, and these teams will control a gym depending on how many players are there winning battles at any given time. For a location near a gym, you can’t offer lures, but mostly likely you won’t need to, as they naturally generate traffic. 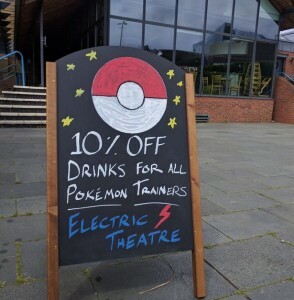 So you can offer special discounts for players who become gym “leaders” by just putting out a sign or promoting that location on social media, using hashtags like #pokemongo or those of the three teams – Mystic, Valor, or Instinct. Continue to promote which team is in control, and offer special rewards to those team members. Even if you are not near a PokeStop or Gym, you can use social media and other promotions to align with the Pokemon Go excitement in your area. Host a Pokemon Hunt, with the start and stop being at your business. Host a post-hunt Pokemon party andbe sure to offer special deals like “show your captured Pokemon for 10% off” or a BOGO for all Pokemon Go players. On social media, give hints to the best local Pokemon to find, or special deals for local teams or trainers. Be sure you are using the hashtag #pokemongo and other Pokemon-related hashtags. Ask guests to show their Pokedex – a listing of local Pokeman you’ve captured – for a discount. Above all, get on the app and learn how it works. Do it quickly, before this runaway train hits the brakes and the initial “lure” of Pokemon Go dies down. This game is a gift to your business; how you use it is up to you!